Roof Top Barbecue with John Lewis. The month of May has brought so much rain that my longing for a spell of dry weather is growing itensely. I know that rain is good for farmers and the gardens and the soil etc but I do hate wet weather and I can't wait for a proper summer to emerge. 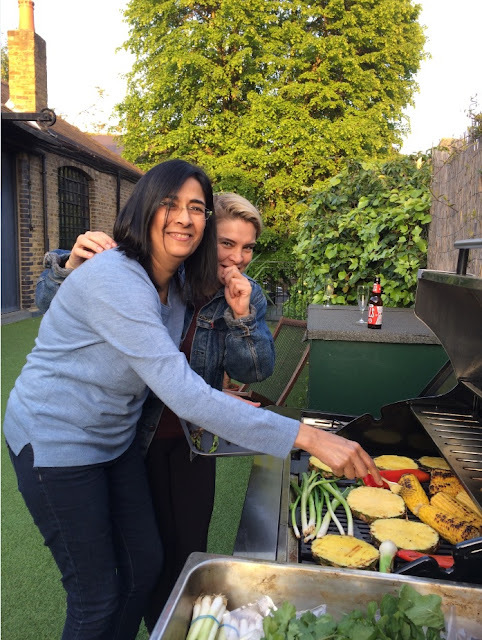 I love being outdoors and relish alfresco dining so when John Lewis invited me to their recent roof top barbecue, I jumped at the chance all along keeping my fingers and toes crossed that the sun shines on the day. As if by magic my request was fulfilled as the evening turned out bright and sunny and warm with not a sign of a raindrop!! The venue a film studio -Brunswick studious with a terrace garden set in residential area of Kilburn was perfect and really quaint. 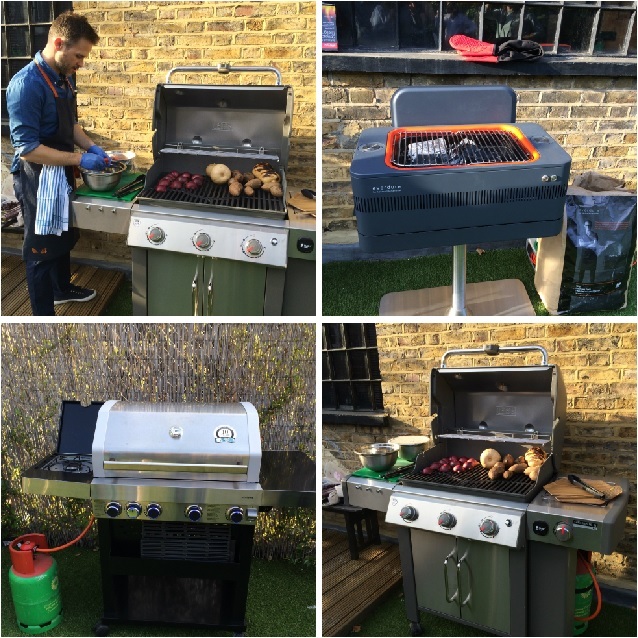 The barbecue was organised to showcase John Lewis's finest electric and gas barbecues and we all had a wonderful opportunity to test them out. Our chef for the evening was non other than Ed Smith from Rocket and Squash, a lawyer turned chef who has recently launched his cook book "On the side" which has a collection of 140 side dishes. Ed showed us how to "burn" food on the barbecue!!!! I think he really meant how to char. 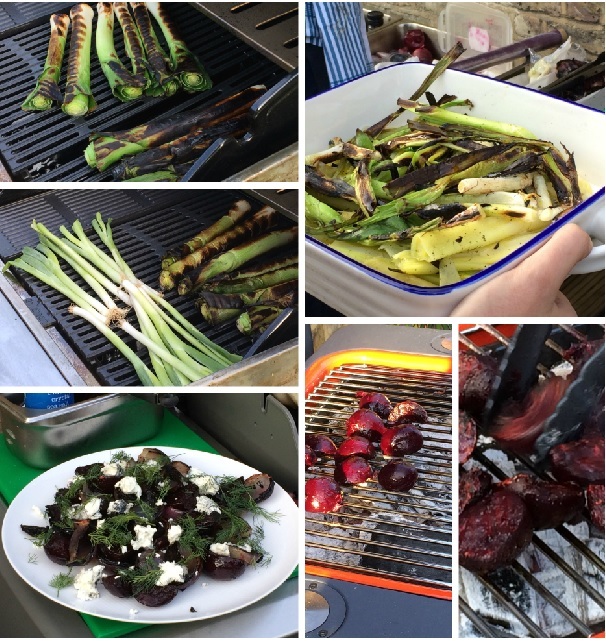 We watched a demo of beetroot and red onions being char grilled and then served with a lovely dill and feta dressing. This followed by char grilled leeks and spring onions and baked butternut squash and sweet potatoes. The leeks were served with a romesco sauce made from char grilled red peppers and almonds. Ed also barbecued some lamb for the non vegetarians. Ed showed us that barbecue food does not have to be boring and all you need to do is be a little more imaginative with your ingredients. With this thought in mind we split into groups, mainly vegetarian and non vegetarians and created our own dishes from all the lovely produce that John Lewis had provided. 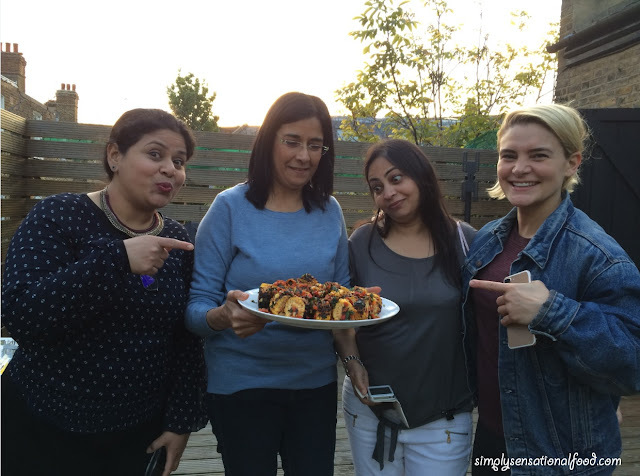 With three other foodie friends, Jagruti from jagrutiscookingodyssey, Manjiri from travelsfortaste and Lisa Moore we set about making our two dishes. Jagruti and I concentrated on the savory dish of Barbecued Sweet corn with Roast pepper and Mint salsa whilst Manjiri and Lisa created a sweet dish Smoky-n-Crunchy BBQ Pineapple. 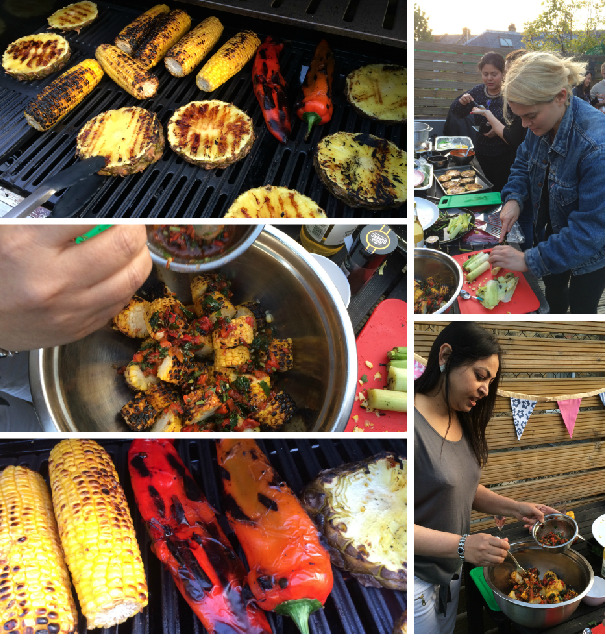 The other teams created some skewers of vegetables and lamb, roasted sweetcorn and sweet potato mash, sweet potato wedges served with a lovely creamy dip and a dessert of baked apples made on the barbecue served with vanilla ice cream. All our creations were photographed by Charlie Richards who is the photographer for the John Lewis Magazine. Once the photo shoots were over, we all tucked into the lovely barbecued feast over lots of chit chat and prosecco. The evening ended with gifts of beautiful signed copies of Ed's book. You can find the recipe for the Barbecued Sweet Corn and Roasted Tomato Salsa with mint dressing recipe in my next post. I would like to thank John Lewis for inviting me to this lovely event, it most certainly brightened the rainy month of May. All the opinions and views expressed in this post are my own as are all the photographs. 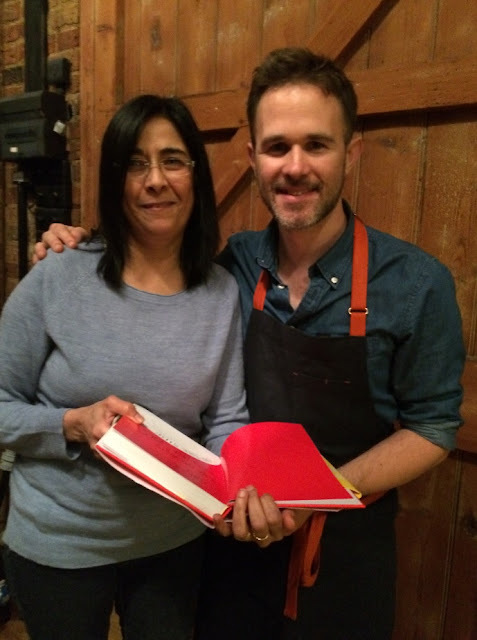 Thank you Ed it was wonderful cooking with you. Watch this space its up next on my blog. This looks like an amazing event! And I'm very interested in hearing that sweet corn and roasted tomato salsa recipes! The book has some lovely recipes. This looks like such a wonderful event. Two of my favorite things .. parties on a rooftop and BBQ. All of the food looks like it was amazing and I can't wait for next time when you post the Barbecued Sweet Corn and Roasted Tomato Salsa with mint dressing recipe! Its coming soon, watch this space. I would never think of a vegetarian BBQ looking this amazing and delicious! Fab work! Check out the John Lewis web site there is a lovely range of all sizes. Oh wow what a fun sounding event I have to admit I would love a good BBQ for the back garden but I don't know if I could actually use one, perhaps I'll have to try and ask my OH to do it. Its actually fairly easy, just put veggies on BBQ and use lots of dips etc to serve them with. Oh that all looks delicious, we are huge meat eaters but this really does look like something we would make! I was well surprised the variety of veggie food there was. Ana, the recipe is on its way soon. Will update with a recipe link once my friend posts it. Absolutely sounds like a good event, I'd love to attend in a event like t his, I bet this is so much fun. It was lovely and there was so much veggie food. It was really funny that he was encouraging us to burn the food!!! Yes hope for some some sunshine this bank holiday weekend. It sounds like it was a lovely event hosted by John Lewis. The food all sounds delicious I do love vegetables on the bbq. Looks like you had a fun-filled barbecue session. I love it too.. every year when we visit our kids in USA during summer we do that almost everyday. Love the smoky flavoured grilled food. Looking forward to the recipe post that you created. Wow what an enjoyable way to cook BBQ. The venue looks great and being shown how to cook by a famous chef is like the icing on a cake. Your recipe sounds delicious so I am looking forward to you sharing it soon. Looks like a lovely event, we're looking for a new BBQ actually, I'll take a look at what John Lewis has. The BBQ pineapple looks delicious too! This must have been really fun Nayna. What a great way to serve the ordinary roasted corn. Roasted pineapple and baked apples... yummy with all the exciting sauces and ice cream. This look a lot of fun! I love BBQ and i would have love to been there. The foods look delish! John Lewis always do a fab job. Can't beat a BBQ... So pleased it's nearly time to have them regularly! I think this is awesome! What a nice way to spend the summer. The grills sound amazing and it's good to have a reliable one that you can cook good food with. The dishes all look yummy! This looks like so much fun! We don't have a rooftop that we can go on, sadly. What a great event! I wish we had a good grill! This looks like such a fun event with lots of yummy food!